The big news for the night sky this month is the appearance of Comet PanSTARRS to residents of the Northern Hemisphere of Earth (e.g., the U.S., Europe, China). We’ve produced a separate blog article for the comet: Click here to read that article. 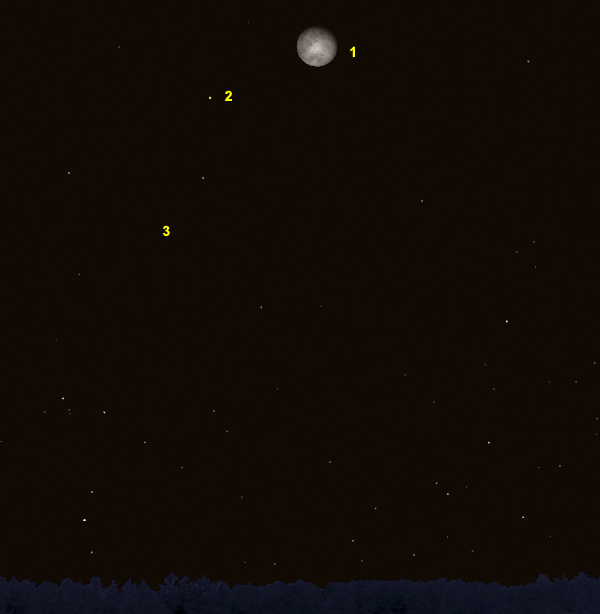 But you can also see the giant planet Jupiter during the evening hours in March 2013. A particularly good night for identifying Jupiter is March 17 (March 18 for those of you in the Eastern Hemisphere of Earth [e.g., Australia, Japan, China, India]). Plus, Saturn rises after midnight and is visible to you early birds toward the southwestern horizon. 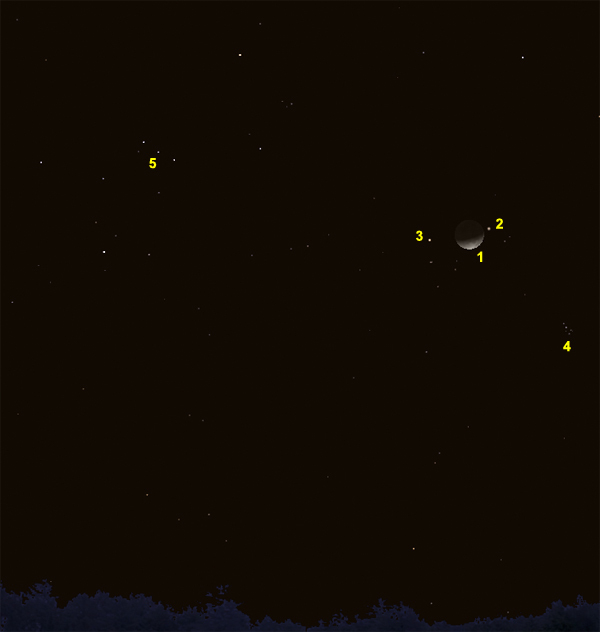 Jupiter and the Moon during the evening hours of March 17. (1) The Moon; (2) Jupiter; (3) Aldebaran; (4) The Pleiades; (5) Orion’s Belt. Look for the Moon on the evening of March 17 (March 18 for those of you in the Eastern Hemisphere of Earth). On one side of the Moon you’ll find the planet Jupiter, and on other side you’ll find the giant red star Aledebaran. This star is part of a V-shaped group of stars called “The Hyades.” Nearby is a group of stars which many people mistakenly think is the Little Dipper. Actually, it’s called “The Pleiades,” and is very beautiful when viewed through a pair of binoculars. All of these objects are in the constellation Taurus. Next door to Taurus is the constellation Orion, which is marked by its distinctive “belt” of three stars. If you can stay up late the night of March 29 (March 30 for those of you in the Eastern Hemisphere), then you can use the Moon to find the beautiful, ringed planet Saturn. What a wonderful way to start the Easter holiday weekend!